The 'spooky' festival of Halloween also known as Allhalloween, All Hallows' Eve or All Saints' Eve is celebrated and observed in a number of countries on 31 October which is the eve of the Western Christian feast of All Hallows' Day. The festival is now gaining popularity in India too, where restaurants and cafes have gone a step further and given a 'desi' twist to the festival. ‘Chudails’ roaming around in a purani haveli to Bollywood songs — no that’s not a scene from any Hindi movie, but a setting for Halloween celebrations. 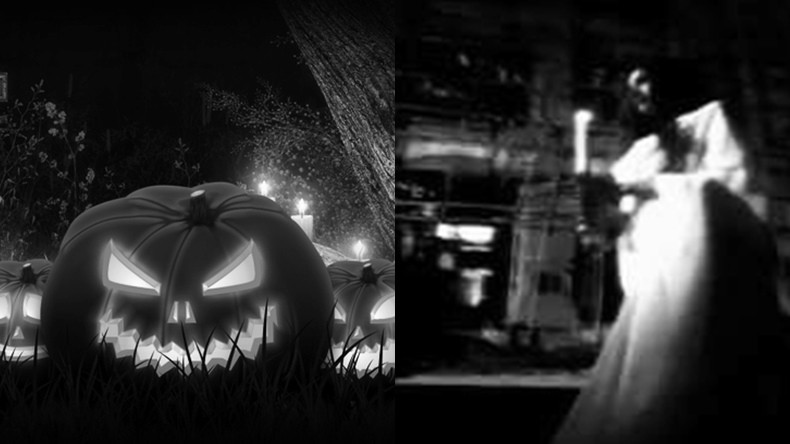 The festival of Halloween, known for its spooky traditions, takes place on October 31 annually. People mostly get together and plan fun activities and events to scare one another, including trick or treating each other. The international concept of celebrating this spooky festival is gradually getting popular in India too with several theme parties being hosted for people to enjoy the ‘scary’ experience. Many places are holding special parties to honour the global tradition, but some places have taken a step further and gave an Indian twist to it. Delhi-based Lord of the Drinks is having a ‘Fright Night’ through which the outlet is rolling out ‘desi’ dishes like the killer pumpkin halwa. “We decided to give Halloween a ‘desi’ twist while staying true to our roots and brought a combination of Indian and western. We all have a Bollywood side to us and the Halloween night will be a perfect opportunity to embrace it completely,” Priyank Sukhija, Owner, CEO and Managing Director of First Fiddle Restaurants Pvt. Ltd., said. From having ‘nagins’ to quintessential white sari clad spirit, the Kaama, Lower Parel, Mumbai, also hosted a ‘desi’ party with DJ Aqeel. “The spooky Indian version with grooving Bollywood music, is something people can expect in the coming years. Unlike any party done till date, we plan to keep ‘desi’ element in coming Halloween parties,” said Haimanti Bhattacharya, Chief Operating Officer at Kaama. According to Sneha Shetty, Head of Brand and Business at The Stables, Andheri East, Mumbai, there are many factors like customer and market trend, that decoded the theme of the event each year. “Today not only the youngsters but also the 27 plus want to dress up and attend such parties and are always up for something that’s new and innovative. Thus our aim is to make Halloween more palatable to mature crowd as well. This we intend to do by acquiring knowledge of customers’ liking and then over all market/consumer trend. The global trend will also be taken into consideration,” Shetty said. There is a business angle to the story too. “Halloween being a billion dollar business globally, which means the global market is warming up with this trend. Thus, we are utilising this trend to keep up with the global trend, this will not just boost the business but also lead to evolution of brand philosophy,” Shetty added. Karan Dharod, partner at LightHouse Cafe in Worli, Mumbai, also mentioned that celebrating Halloween “affects restaurant business positively”. Shisha Bar Stock Exchange also hosted ‘Darr Night’ in full Bollywood style with DJ Siana Catherine. Apart from Bollywood, some places are taking notes from popular international series and turning it into their theme. From having a “Game of Thrones” inspired menu and decor to planning a ‘Stranger Things: Gateway to the Upside Down’, TabulaBeach from Delhi is adding a glitzy touch to the celebrations. For the ‘Stranger Things: Gateway to the Upside Down’ event, which will be held on November 3, the interiors will be transformed into the alternate universe with strange creatures walking around. They are also providing make-up, face painting and special effects by celebrity artist Aradhana Khanna and Neha Dhara. As a different activity, celebrity make-up artist Elton J Fernandez, Kavya Trehan – singer-songwriter and one-half of indie pop band Mosko and Shaan, electronic DJ and music producer, joined Budweiser’s “Join the Fearless” campaign, which urged people to face fears on their own terms. So, ignore the fact that Halloween is coming in the beginning of the week, and enjoy a ‘spooky’ night out.